The ninth house refuses to believe in boundaries, and Uranus allows you think outside the box. Your love of learning is infectious and people listen to your ideas, no matter how radical they may be. And that’s good, because you want people to play devil’s advocate with your new theories. After all Sagittarius is the ruling star sign for the 9th house! 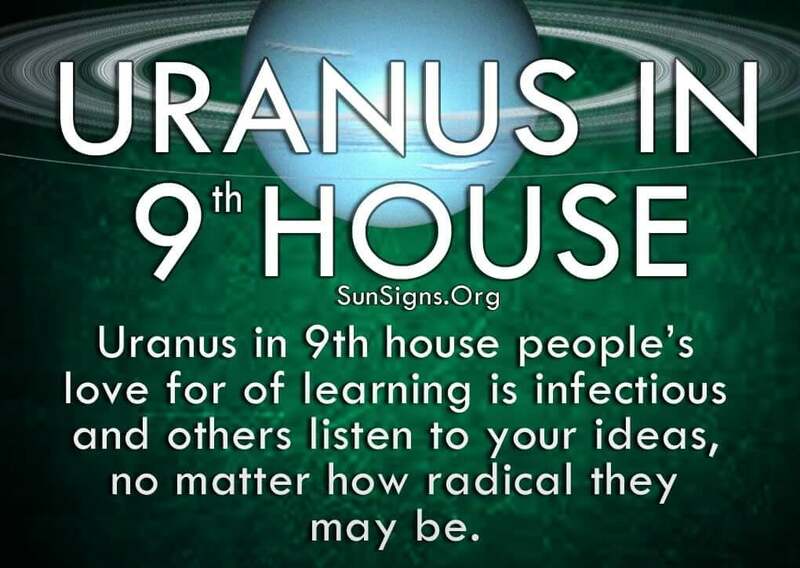 Uranus is symbolic of originality, radical thinking and innovation, and your ingenuity in the ninth house has no limits. Adding to your knowledge is what you do best, and no one or nothing can stop you from your quest. You aren’t surprised by anything and are very open-minded toward unique ideas and radical theories. You listen to the world philosophies of anyone willing to share them and are against any kind of conventional wisdom. People with Uranus in ninth house think traditional values are too conservative and are always looking for new beliefs and morals to study. This is why you love traveling and meeting new people. All of these new experiences paint a unique picture that eventually becomes part of your personality. You love to expand your mind and your mannerisms to include original and thought-provoking ideas. Boring is not in your vocabulary, for you don’t have time to sit still and be bored. There’s too much going on in the world. What you have to your advantage is tenacity. You refuse to believe that finding happiness is impossible, so you will do whatever it takes to achieve that end. There are no limits to your imagination so you feel as if there are no limits on anything you want to do. You throw out conservative thinking for a more open approach and this allows you to take any new idea out for a spin. Find your Uranus sign to know more. The thing that might be difficult for the Uranus in ninth house is balancing a career that will most likely involve travel with a committed relationship. You have a large social circle. You enjoy going out over staying at home, and you meet new and interesting people all the time. This is ideal when you only care about dating, as you aren’t tied down to one person or place. But if you find a void because you want someone to come home to on a regular basis, that is a tougher issue to handle. Finding someone who is okay with you leaving at a moment’s notice (because you always come up with new ideas on a whim) is not an easy task. And finding someone who has the time and money to take off with you at a moment’s notice can be even harder. This is where you’ll really utilize the creativity of Uranus in 9th house to come up with a solution. There is a way to have it all, but it won’t be easy. With Uranus in 9th house in your astrological chart, you have to be careful not to ignore ideas just because they have been around for a while. It’s because they have stood the test of time that they became good ideas. Don’t dismiss someone who seems to be too traditional in their thinking, because then you will be as bad as those who dismiss an idea because it’s new. Listen carefully and use your curious mind to your advantage. Ask relevant questions and decide for yourself if the older theories still have merit. Your ability to seek out new ideas is unmatched, but don’t let it overshadow great ideas that already exist.